The Oracle Storage team has over 30 years of experience in the design of mezzanine floors. We have the skills and knowledge to deliver cost-effective, bespoke mezzanines that optimise space. We specialise in the design, delivery and installation of mezzanine flooring for storage & warehousing, automotive, e-Tail, offices, retail, leisure and manufacturing facilities across the U.K.
We pride ourselves on our mezzanine floor design and quotation process, please read our guide to this and contact us to organise a free site survey. We take responsibility for ensuring that your mezzanine floor is designed in compliance with current building and fire regulations, quality standards and best practice guidance. View a selection of our mezzanine floor case studies. With notice we can organise visits to certain case study sites to further show the quality of our work. We have tailored staircases for every mezzanine flooring installation. Whatever your requirements, we have the ancillaries to satisfy all environments, either industrial or commercial. We can offer a wide range of colour combinations of mezzanine floor staircases to ensure that your new mezzanine is aligned to a your brand image. Complete the form below and a member of our team will call you back to discuss your mezzanine floor requirements. It depends on the type of mezzanine project. We recommend you allow at least four weeks' lead time from the point of approval on an approved mezzanine design. However, we'll always try to offer more flexibility and reduce lead times where possible, please call call us to discuss your project and find out. A quick mezzanine flooring installation begins with good design and consultation. We pride ourselves on our ability to fully understand client needs, so we can deliver a mezzanine project on time, on budget and to the agreed quality standards. We can tailor the installation programme to suit your needs, wherever your project is located. With our international network of over 250 qualified, experienced mezzanine installers, engineers and project managers we're in the best position to deliver your mezzanine floor. We deliver mezzanine projects across the U.K. and Europe. As we are ourselves based in Berkshire we can often provide same day free site surveys to Berkshire, Hampshire, Oxfordshire and being on the M4 and Paddington fast lines London is included in this. We design, manufacture and install mezzanines of all sizes and levels of complexity. We are experts in delivering both small and large-scale mezzanines. Increasingly, we are asked to deliver specialist vehicle storage mezzanines. Our internal system enables our mezzanine design team to quote within a few hours. Our quotations are thorough and accurate, and we'll identify cost savings in line with your exact commercial and technical requirements. In order to provide an initial quote over phone/email all we require is the size of the mezzanine, the finished floor height, what the floor will be used for, number of staircases and if fire-rating is required. If you are unsure about your floors construction our technical team can organise core samples to test strength. Not always. You will need to refer to building regulations, this is something we can advise you on. 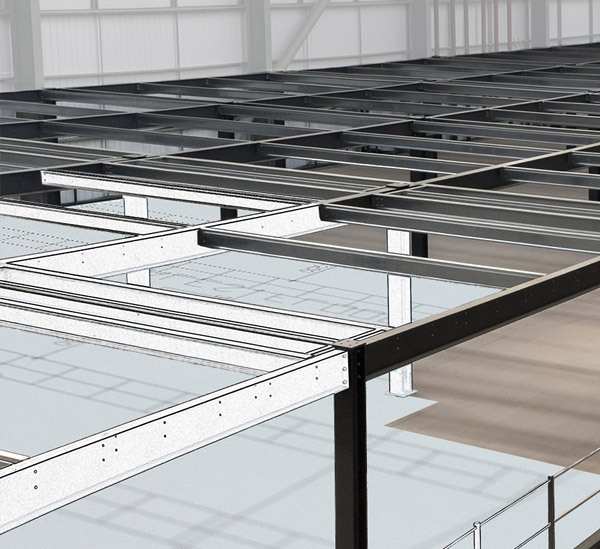 Each mezzanine floor installation is individually designed to meet your precise technical. We specialise in maximising space, and as such can advise loading for static, and moving: storage and materials handling equipment for warehousing & storage and distribution centres, as well as manufacturing production sites, and office, leisure and retail premises. Yes. We don't fix to buildings. Effectively a steel mezzanine platform is a reconfigurable solution and flooring system that gives you flexibility on leases to scale up and down in line with your operation's technical and commercial needs and moves. We take health & safety at work very seriously, and do everything we can to ensure a safe working environment for all our employees and contractors. We invest in training to promote safe behaviours at work, and implement the advice and best practice standards regularly delivered by our qualified, chartered health & safety professionals. We design, manufacture and erect the steel mezzanine and decking, but the planning application can be made either by us or you to a registered approved inspector. They will then respond with queries before submission to the local authority for approval.